Among all the challenges associated with a North Korean collapse, the use of weapons of mass destruction (WMD) or movement of WMD out of the country will have the largest strategic implications. 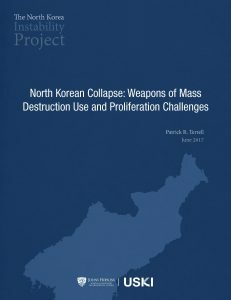 The extensive size and complexity of North Korea’s nuclear, chemical and biological (NBC) weapons programs make it virtually impossible for the alliance between the United States and the Republic of Korea (ROK or South Korea) to have 100 percent clarity of intelligence and greatly increases the likelihood that regime forces, individual opportunists, fleeing members of the regime leadership or breakaway separatists could gain access to WMD. Therefore, it is useful to examine these programs, both in terms of historical examples of chemical and biological use in low intensity conflicts, and potential future employment and proliferation scenarios. This approach will permit a better appreciation of the WMD challenge associated with a collapsing North Korea that is grounded not only in plausible speculation but also in historical precedent.